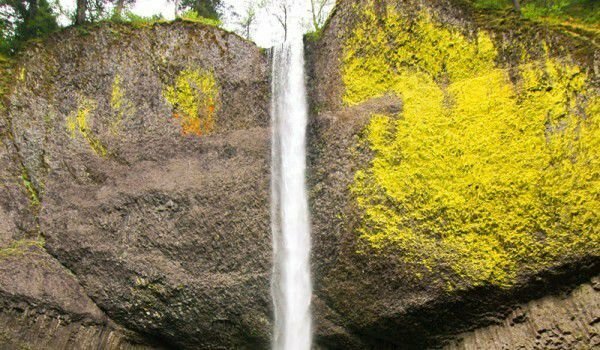 Latourell Falls is the first landmark that is visible on the panoramic route of the Columbia River Gorge, then follow several beautiful waterfalls, which are also worth visiting. Latourell is located in Oregon, within the National Park Guy W. Talbot. The beautiful Latourell waterfall can be easily reached by the panoramic motorway of the gorge of Columbia, and is located about 5 miles east of Crown Point and about 3-4 miles from the town of Bridal Veil. A short marked trail can be used to reach the base of Latourell as well as its upper parts and observation points. From here opens a beautiful view of the gorge itself. Latourell’s waters fall from a height of 249 meters, among the basalt cliffs of the area, forming one of the most impressive forms in this part of the state and generally throughout the Pacific Northwest. Some views of the majestic Latourell are already noticeable along the way of the historic highway in Columbia Gorge. In this part of the country, Latourell is one of the most iconic and famous waterfalls, mostly because of the uniquely beautiful way the water stream flows between the basalt cliffs. The way Latourell‘s waters descend is powerful, it reminds a lot of Multnomah Falls. To get from the location of the parking lot of the park to Latourell and return, you will need no more than about 2 hours, of course, unless you choose to enjoy the magnificent natural phenomenon longer. The waterfall is named after Joseph Latourell, which is one of the first settlers in the area of the Columbia River Gorge. To reach from the base of Latourell to the upper part, you will have to overcome a displacement of about 100 meters. An extremely nice opportunity is available, to go behind the waterfall, if you want to cool off on a hot summer day. It is best to visit the natural landmark in the period from March to June, because the waters are deep and most beautiful then and because the climate is most suitable for such an outing.